EARTHQUAKE AND TSUNAMI NEAR SENDAI, JAPAN..see satellite images here and more here. The Heat is on in the Konkan. Ratnagiri again reaches 39.4c, i.e. 9c above normal. The extreme heat on the 15th of March is in the Sindh/Gujarat region, with Turbat in Pakistan scaling 42c, and Bhuj at 41.2c alongwith Rajkot at 40.5c. And Turbhat in Pakistan has managed a 42c, and Karachi touches 38c, (both estimated by Vagaries) with 39c possible on Wednesday. The Northern plans of India and Pakistan are measuring into the mid 30s (See map). Now these regions will rise into the high 30s this weekend, un- mindful of M2. W.D. (M2) is approaching India and expected to precipitate rains in the Northern States of Kashmir and H.P. from Thursday, 16th. March. M2, is expected to gain by Saturday/Sunday as the depth at the 700 mb levels is expected to be around -40, enough to precipitate fairly good rains in the state and snow on the higher ranges on Saturday. M2 temperature effect: It will keep the weather in the extreme North hilly region cool enough for normal regional pleasant weather to continue in the hilly states. System may not be effective to contain the rising temperatures in the Northern plains. Temperatures in Punjab, Delhi, U.P. Haryana, and Rajasthan will see the seasonal rise this week, into the 36-40c range. But, Gujarat and Maharashtra, especially the Konkan, which has days shooting up to above normal heat wave conditions, with temperatures above 40c, will see the day's heat peaking on Thursday, with a 42c in Gujarat, before retreating to 38/39 Friday onwards. 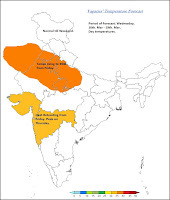 Gujarat will see a restrain in day temperatures only by the end of this week. Northern Pakistan will get the precipitation from M2 on Thursday. In Pakistan, similarly the effect will be in the coastal region, with Karachi falling back to the 33c level by Friday. Similarly, Sindh will see a peak temperature effect of 44c on Thursday, with the days getting better from Friday. Islamabad will maintain its 30c level, but get cloudy from Thursday, when there can be a slight drop in the day temperature to around 28c. Mumbai.Winds will divert back to NW, throughout the day from Friday. day to 38/39c. Nights going up to 23/24c due to the loght cloudings. Thursday: Waiting for M2. Highs with NE winds will be around 37c and the variation in the day-night continues with the lows at 22c. Low humidity again makes it a "sweatless" day. Friday: As M2 gains over the Northern most states, winds become NW to N, and the day temperature sees reason. Highs will drop by 4/5c from the last few days and reach a high of 33c on Friday. Nights will be same around 21c. Saturday: Much better than the weekdays. With NW breeze, the thermometer will manage 33c, but the mornings could be a bit pleasanter (W.D. effect) with the low dipping to 19c in the suburbs. Is low humidity in Konkan and Madhya Maharastra this part o fthe year a normal occurence ? the imd reading for santacruz is 40.6 c at 2:30 pm,,,really irritating . panvel was much hotter than this,,,,i was feeling that i am in riyadh saudi arabia where i stayed for 17 years,,,,the wind was strong hot and dry,,,loo like.